Not until the early twentieth century did crab become a popular food along the West Coast. The particular crab that rose to fame was the Dungeness variety; the name comes from Dungeness, England, and has been applied to a bay, a spit, and a small town on the Olympic Peninsula. Dungeness crabs proved to inhabit the waters of Puget Sound and all along the Pacific coast well into California, where San Francisco’s Fisherman’s Wharf was developed in great measure to house the fleet of crab-fishing boats. A still-fabled dish is crab Louis, a hefty entree-sized salad featuring large chunks of meat from the crab legs arrayed on a bed of shredded iceberg lettuce, garnished with sliced boiled egg, a lemon wedge, tomato wedges, and sometimes an olive, and doused with a spicy Thousand Island-type dressing that usually includes chili sauce. 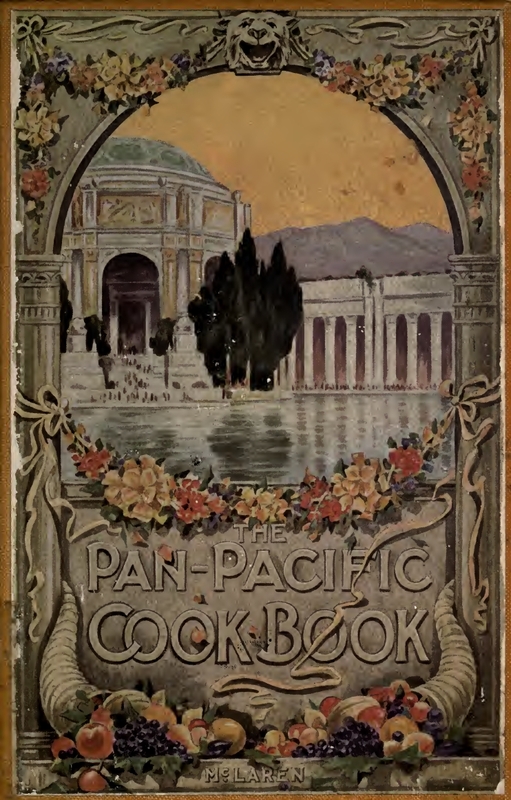 The origin of the crab Louis is debated, but credit is usually given to San Francisco; Clarence E. Edwords’ Bohemian San Francisco (1914) includes a recipe from Solari’s restaurant; it appears on the menu of the Old Poodle Dog restaurant there in 1916 (as, surprisingly, “canned crab legs á la Louis”), and a recipe is to be found in the magisterial Hotel St. Francis Cook Book (1919) of Victor Hirtzler (albeit with French rather than Thousand Island-based dressing). L. L. McLaren’s Pan-Pacific Cook Book of 1915 had these exceedingly brief instructions for Crab Louis: Mix a cup of shredded crab meat with a generous amount of mayonnaise colored with tomato catsup and seasoned highly. Serve in cocktail glasses, surrounded with crushed ice. The original crab Louis has also been attributed to the celebrated Louis Davenport restaurant in Spokane, Washington, but the evidence so far is anecdotal and seems to be tied to Mr. Davenport’s name. For that matter, however, the name is, otherwise, unattributed, so the matter needs some investigation! In Portland, The Neighborhood Cook Book (2nd edition, 1914) boasted a dozen recipes for crab entrées, in addition to several crab appetizers. There are two crab cocktail recipes that call for a dressing that features mayonnaise and chili sauce, chopped pimentos, and paprika, which approaches the San Francisco model for a crab Louis. When the third edition of the cook book appeared in 1932, it had a crab Louis recipe that was simply shredded lettuce topped with large pieces of crab and dressed with a vinaigrette that was amplified with chili sauce, Worcester sauce, and dashes of paprika and cayenne. James Beard recounts in his New Fish Cookery (1954) that the Bohemian Restaurant in Portland “served the finest Louis I have ever eaten” in the 1910s; Beard’s own recipe specifies a dressing compounded of mayonnaise, chili sauce, and heavy cream with grated onion, chopped parsley, and cayenne, garnished with quartered hard-cooked eggs and tomatoes. The menu for Portland’s Benson Hotel in 1916 offered “crab legs, Louis,” while the ritzy Hazelwood restaurant menu touted “Crab Louis Hazelwood” in 1919. Crab Louis was a favorite luncheon and dinner salad through the 1960s; for my mother, finding crab Louis on a menu was an assurance that the restaurant had aspirations to gourmet status. 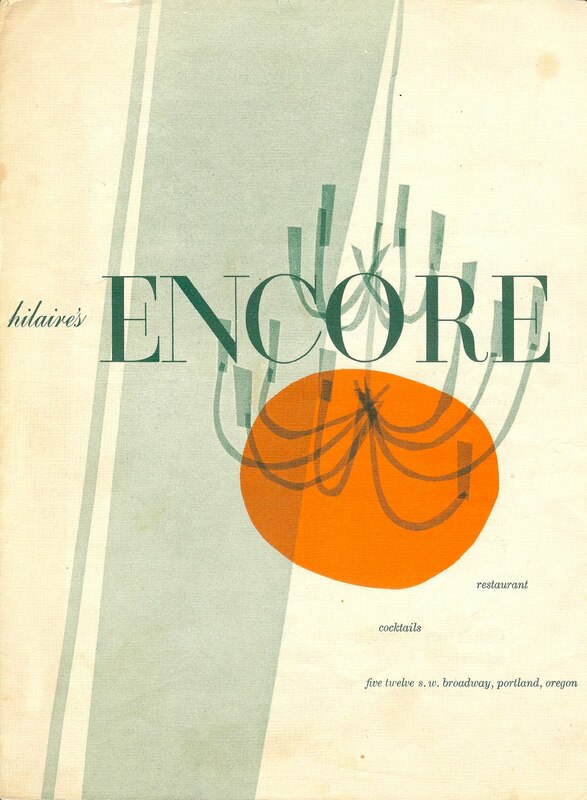 The menu from Hillaire’s Encore in Portland from the late 1950s grandly offers a “crab louis magnifique” for $1.35. Mother would have ordered it, for sure. Update: A Portland recipe for crab louis from 1912 has surfaced! See more about it at Crab Louis: 1912.